I’ve now seen the film, and I thought it was excellent. Imperfect, yes, but fascinating and unique. 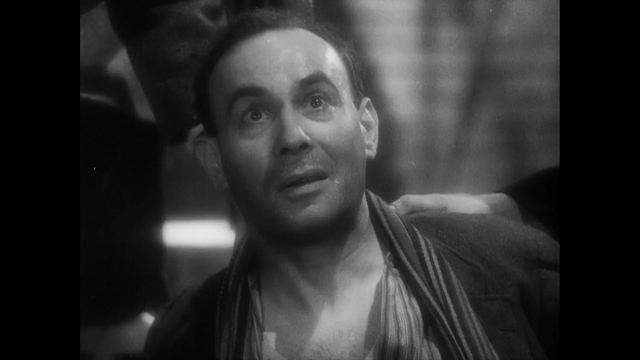 The closest comparison I can come up with is Strange Cargo, Frank Borzage’s weird religious allegory which deals with a gang of convicts escaping from a tropical prison island, finding salvation along the way. But The Passing of the Third Floor Left brings its rogues’ gallery into contact with the numinous in a modern London hotel. 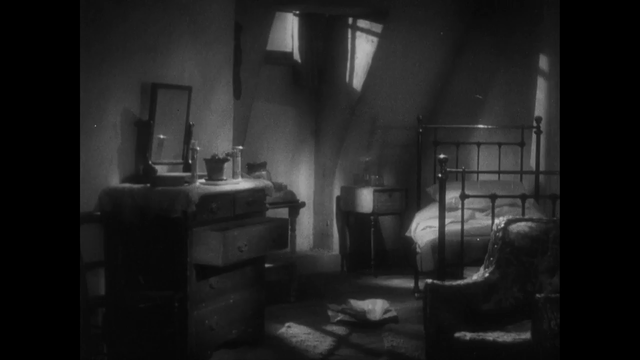 What both films have in common is Jesus, encorpsified (to use Flann O’Brien’s word) as a convict in the Borzage and as a myseterious tenant in Berthold Viertel’s film. 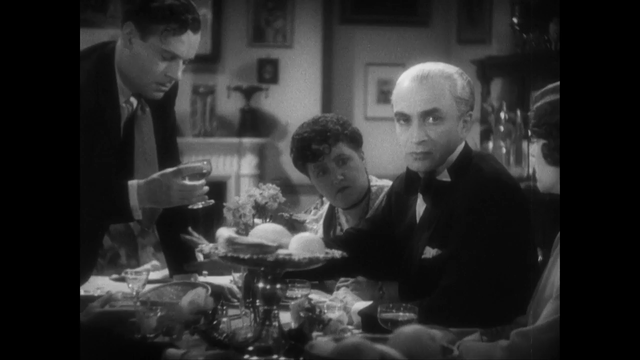 More to the point, embodied by the august personage of Conrad Veidt, whose presence makes Viertel’s expressionist touches seem wholly legitimate and rooted in the old world of Caligari. As a snapshot of a certain kind of life in inter-war England, the film has considerable social interest, with snobbery and class distinctions under the microscope, and the lens used by the authors is that of allegory. Describing himself as “a wanderer,” Veidt’s Stranger combines aspects of Christ with the figure of the Wandering Jew. Also, like Captain Kirk, he’s forbidden to interfere in affairs on the world he’s visiting, a fact instinctively recognised by the satanic Mr. Wright. 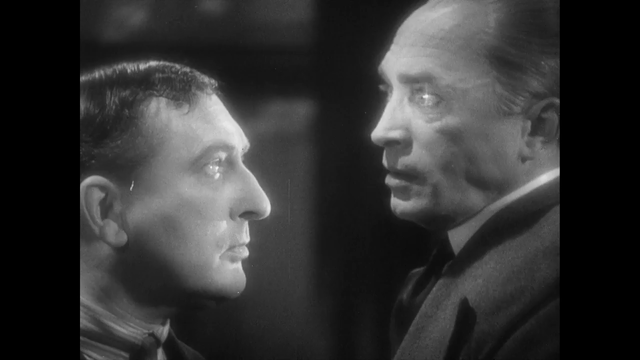 Cellier, as the ironically-named Wright, looks like a fleshier Hitler, minus moustache, and is both a very earthly man-of-the-world, and a character with one foot in Passion-Play himself: he’s the only one who recognises who Veidt is (whoever he is) and what he’s about (reclamation of lost souls). As in Dennis Potter’s Brimstone and Treacle (1982, surely influenced by this) it’s the bad man who’s able to recognise the presence of the divine or satanic. Cellier also partakes of Christ-like duality: he’s definitely a mortal man, but at the same time the conscious representative of something more, or less, than human. 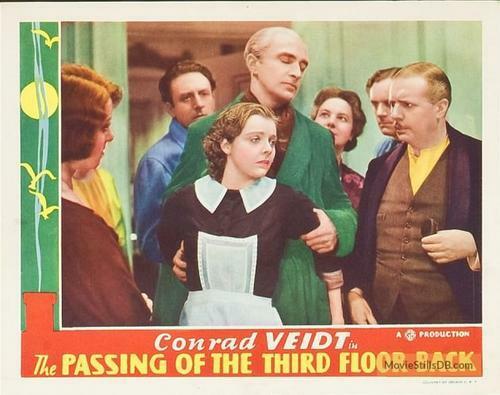 Conrad’s role as a saintly Stranger in “The Passing of the Third Floor Back” was the most difficult character he ever played, and to me it was the most wonderful of all! He is the angel that one could always pray to and wait for. He is the superior being that gives faith and wisdom to people who are in great need and difficulty. He is the messenger of God who shares his knowledge and kindness with the ordinary human beings. He is that strange and highly emotional presence that moves your heart and soul so deeply, that you could never feel or behave the same way you used to in the past, before the encounter with him. He is the light of faith that one sees, and the whisper of love and gentleness that one hears in her or his mind. He is the guardian angel that looks after you and protects you from the evil creatures and cursing thoughts. He is the exegete of the superior, better world, where everyone feels free and trully happy. He is the stranger in a strange world, and the angel in a heavenly world. Connie is now himself the character he once played: to some people, an enigmatic presence, to others, a special presence, that brings light and hope for a better world, that he so much wanted to see when he was a man on this Earth. The Catholic Church itself invited the Christians to watch this extraordinary film, which reflects the idea that no matter how much the Good and the Bad fight, people will always be in the middle, and they will never be completely good or completely bad. People will continue to make mistakes and have remorses, they will continue to make happy or hurt each other, and some of them will learn, others will not learn a single thing from all the experiences that destiny provides to everybody’s lives. Because this is the natural passing from one floor to another, in an endless journey of our body and soul.